You are here: Home / Jewelry / Rings / Early Art Deco sapphire and diamond filigree ring. 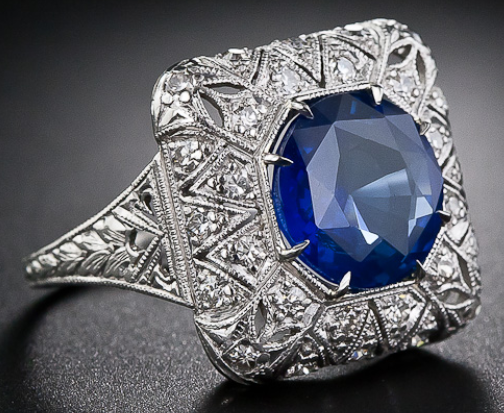 Early Art Deco sapphire and diamond filigree ring. I’m pretty sure that when I looked at this ring my mouth fell open and my eyes bugged out like I was a cartoon cat looking at a mouse. Hey there, beautiful. Did it hurt when you fell from heaven? A major part of what makes this ring so remarkable is that center stone, a 4.50 carat royal blue Ceylon sapphire. The delicately milgrained octagonal setting is as stunning as the stone itself. Around the setting is a cloud of tiny, sparkling diamonds within a pierced stylized star motif. To quote Lang’s description, “No attention to detail has been left unpaid.” The ring’s gallery is elegant scrollwork, the millegraining and engraving continue all around the rings shank. They posted a lot of pictures of this baby and I’m showing you every single one. I bet you don’t mind. This stunner is currently for sale at Lang Antiques. All images and info are thanks to Lang.